260 years ago today, a young man of about 22 years, along with two of his brothers, arrived in the port of pre-Revolution Philadelphia. He came from a region in Germany called the Wetterau, and his journey across the ocean had lasted at least seven weeks in conditions that were not the best. His name was Ernst Christian Menge, and all this time later, we can claim this man as our 5th great-grandfather. His story is an amazing one - here is a link that gives the highlights of his family's lineage in America. In the life of Ernst Menge, there were probably several other factors besides political unrest that called him to the New World. Ernst was the youngest in his family, and so he would not be included in any family inheritance, although it's not clear that the family owned any land. Ernst's father was a church elder, and there is evidence that Ernst and his brothers were involved in the occupation of 'strumphmacher' or stocking makers. Ernst's mother, Anna Catharina Rieß, had just died in 1753, and at the same time, there was word of life in America from his cousin, Martin Kreuter, who had gone to America in 1751 and returned to Södel to marry Susanna Louisa Bonne on 25 Apr 1754. Maybe because Martin was then returning to Philadelphia where apparently other Kreuter cousins were already living, Ernst and his two brothers, Johannes and Henrich, also decided to make the move. The journey was, however, probably not easy. 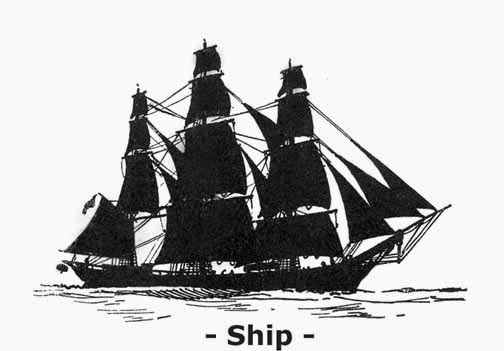 During this time period, the immigrant ships carried as many as 300 passengers. This account describes what the journey might have been like for a German immigrant to Philadelphia at that time. And what was life like on the day of arrival? Well, the bells in Philadelphia were a-ringing to announce the arrival of a ship with German immigrants. After taking the oath of allegiance to England and then paying for their passage, they would have been greeted at the dock by their Kreuter family and friends. Life in the New World was about to begin! Read more in an excellent account here. It should be noted that Ernst Menge probably made it to America just under the wire, as nearly all immigration to America was halted during the Seven Years War. Had Ernst not left the Wetterau when he did, and considering the high cost of life in that war, it's entirely possible he might not have come to America at all, and then all the history of our family would certainly be different. But instead, by the time of Ernst's arrival in Philadelphia, roughly 40% of the population of the Philadelphia colony were German peoples. Germans lived in their own communities and had their own German-language newspapers. The challenges in the New World, especially during the struggle for American independence would not be trivial. But our Menge family was part of the story that shaped a new democratic nation. This is as good a time as any to be grateful for the courage and determination of our German ancestors. Thanks to them who made such incredible journeys.